The Ortlieb Bikepacking Handlebar Pack is noticeably wider than conventional bar bags, so it should easily take, say, a sleeping bag. As is the Ortlieb way, the Bikepacking Handlebar Pack's mounting arrangement shows real German engineering genius. An inner Velcro strap is anchored to an internal nylon strut to give the pack stability. This arrangement allows you to quickly Velcro the bag in place, then secure it with the outer orange webbing straps. An extra strap securing the handlebar pack to the handlebar stem makes it even more stable. The introduction of this new Bikepacking range from Ortlieb, the company, most synonymous with waterproof bicycle bags, offers further proof of the growing interest in bike packing in general and bags that require no racks in particular. 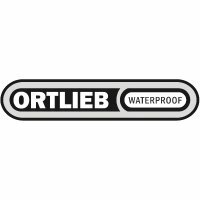 Ortlieb's signature honeycomb-textured, 3D-welded, waterproof PU-coated ripstop nylon construction and its roll-top closure creates a particularly neat, rounded pack. An external shock straps are a natural place to carry extras, such as, say, the jacket or armwarmers you remove once you've warmed up. 20cm high x 58cm across x 20cm deep (approx 8 x 23 x 8 inches) = approx 15 litres. German engineered the Ortlieb way - see our blog. Ideal for all-weather off-road adventures, the Handlebar-Pack keeps gear secure and dry in all weather conditions. Its cylindrical shape holds up to 15 litres and is ideal for soft, stuff-able items like an insulated jacket or sleeping bag. The robust fabrics and fittings ensure long term durability. The twin roll closures promote easy access and allow any size load to be centered in the middle of the bike. The Handlebar-Pack fits easily and securely to the bars using twin straps and adjustable spacers. The lightweight internal stiffener and stem strap further improve security and stability. Velcro straps help to attach the bag to the bars. Bikepacking starts where classic cycle touring ends. From all-out backcountry off-road expeditions on a mountain bike to light and fast 'credit card touring' on a road bike, Ortlieb's new range allows you to carry kit on a bike without the limitations of traditional racks and panniers. Bikepacking is an outdoor adventure that starts where bike touring stops: at the end of paved roads. If you want to feel simultaneously free and at home in nature, the combination of biking and sleeping outdoors is just the thing for you. What you need: a gravel grinder, a mountain bike or fat bike, a thirst for adventure, and light baggage. The bikepacking equipment from ORTLIEB lets you set off immediately – for a long day‘s excursion, an overnight trip, or a multi-day tour. With the different packs, you can quickly store everything you need over the whole bicycle so that it is compact and absolutely watertight.